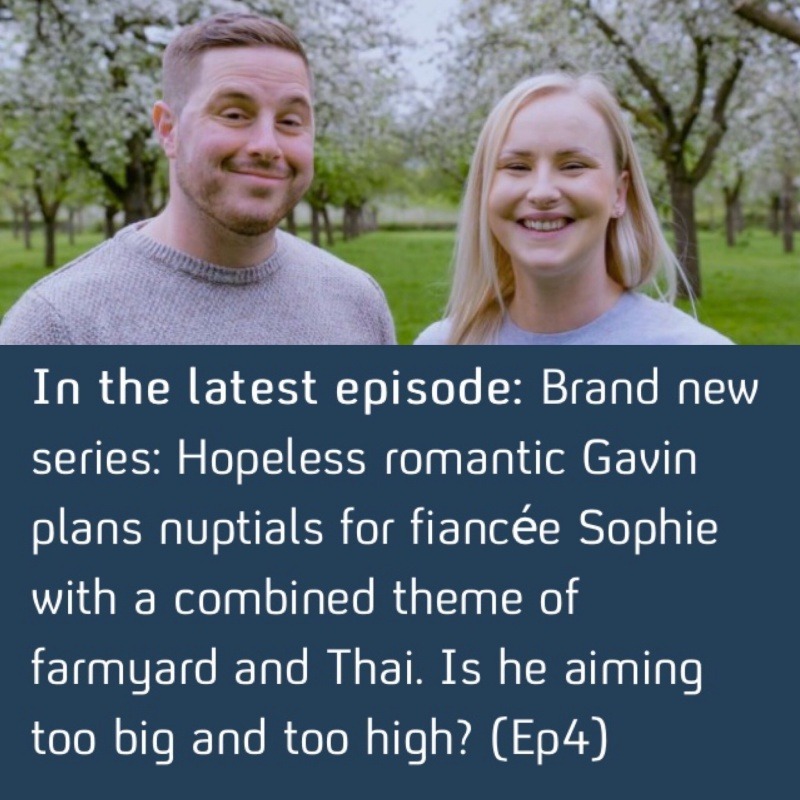 This is what I’d been waiting for, the reminder from Channel 4 that my bride and groom, Sophie and Gavin’s ‘Don’t Tell The Bride’ wedding was being shown on TV that evening. What really happens on ‘Don’t Tell The Bride’? Can we really believe it is just how it’s shown on TV? Well, I can tell you!! For in June this year I had one of my most interesting and exciting experiences as a wedding celebrant. Completely out of the blue, on a Tuesday, I received a phone call, from someone introducing himself as Chris, asking whether I was available for a wedding ceremony that Saturday. He told me that it was for a popular TV Wedding programme, and he ( Chris) and Lee, the two best men, along with the groom, were organising it all – oh, and they didn’t have much money left. Now let me think – what TV programme could that possible be ??!! I did in fact have flights booked for a holiday with my daughter on that day, so after telling Chris I’d get back to him in a few minutes, I WhatsApped my children – they were so excited and told me that I simply had to do it. So I changed the flights, rang Chris and said yes, I’d love to ! And, as I was really wanted to be part of it, and they were rather skint, they got me for the price of the flight change! Well, that was my rather exciting Tuesday. On the Wednesday and Thursday I heard nothing. By Friday morning, I was beginning to think I had imagined it all, when I received a phone call at lunch time from Chris, asking me to be at a pub in Taunton, at 5pm. Here I would meet the groom ( I wasn’t told his name) and could spend an hour chatting with him, in order to write the wedding ceremony. And I only had an hour as he had a haircut booked straight after !! I was also given a number to ring when I got there. At the pub, I rang the number, it was the guy from the production team, he came out to meet me, put a mic on me, told me the groom was called Gavin and filmed our hour slot! As you can imagine, the hour went by really quickly. I really tried to use that time to get an understanding of the uniqueness of their relationship. Gavin was clearly deeply in love with Sophie and wanted a beautiful, loving, traditional ceremony, one that also reflected his sense of humour and included their adorable little boy. The hour was up and as I was leaving, I mentioned the confetti word – Gavin just looked blankly at me – no, he hadn’t thought about it and there was absolutely no way he could get some – I’m sure she’d like some I said, just leave it to me !! And, it was all so secret, I still didn’t know where the ceremony was being held. The first thing I did when I got home was contact the most amazing florist Lorna from Luce Loves Flowers. She makes amazing petal confetti from her own flowers. I knew she’d come to the rescue. 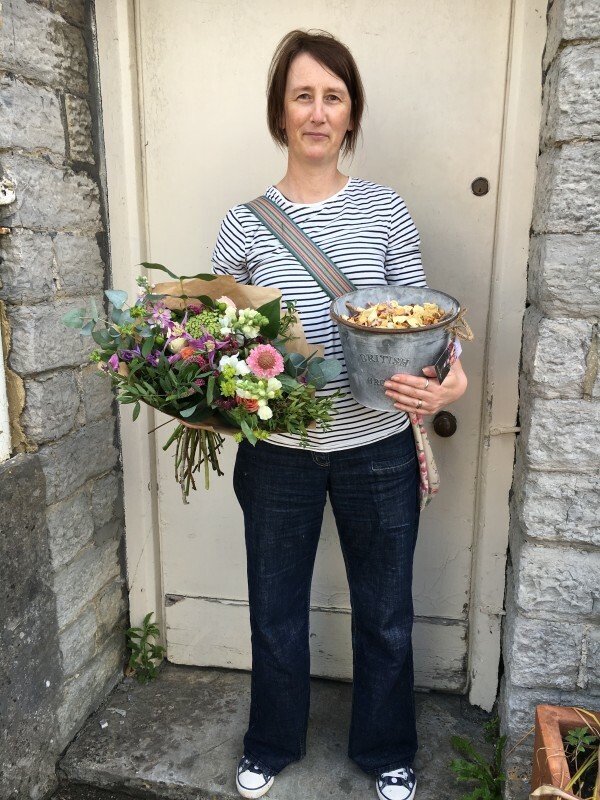 She even delivered them to me early the following morning in two rustic buckets and handed me a beautiful bunch of flowers for the bride. Anyway – I had a ceremony to write. I wrote a very classical and traditional ceremony, I wrote it for Sophie and I wanted it to be beautiful. This is the Gavin and Sophie I got to know. A young, vibrant couple, very much in love, with a little boy they adore. The Don’t Tell The Bride crew filmed for three weeks. One team followed Gavin and another team followed Sophie. What clearly came across in the programme was how much they love each other, but not what lovely, chilled, funny, kind people they are. I know we’ll stay in touch !! The following morning I printed out the readings onto parchment, checked the ceremony script, thanked Lorna for the amazing confetti, got ready and waited for the phone call !! Lots of different scenarios for the wedding ceremony ran through my mind. Please don’t let it be in a hot air balloon or on a fairground ride or make me dress like a Dalek – what had I signed up to?!! Yes – It really was this top secret!! At last the phone call, telling me that I needed to be at Fire Beacon in the Quantock Hills at 2pm. 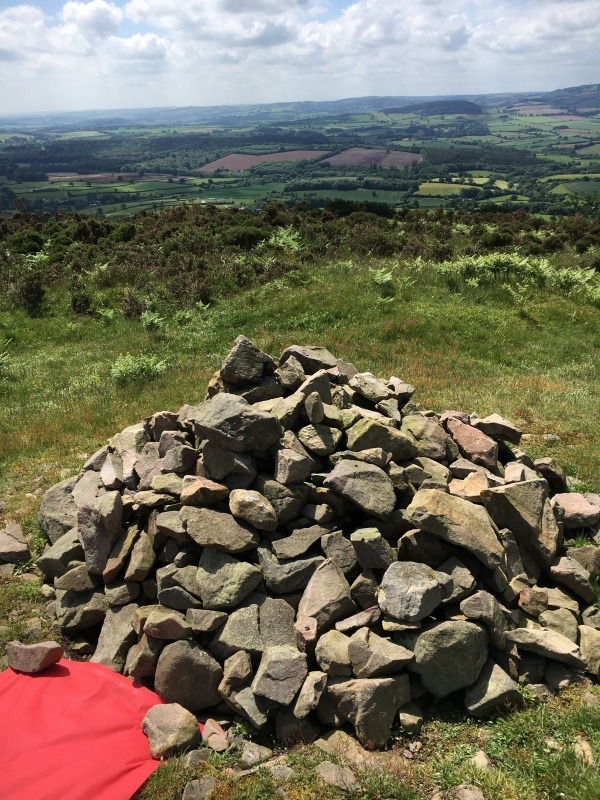 I was so excited – I knew that this meant an outdoor wedding on the cairn at the summit of Beacon Hill, with a backdrop of the most stunning views over Exmoor and the Bristol channel beyond. The sat nav said just under the hour to get there – My partner, Brian, drove. We gave ourselves three hours, just to be on the safe side. It was a wise decision. The Quantock Hills are known for their wilderness and tranquillity. We drove through heathland and wooded coombes, through narrow lanes of undulating hills. We saw wild horses roaming and feasting on the scrub. A herd of red deer ran in front of us, but could we find Fire Beacon ?At last, thanks to a couple of walkers, we were on the right road, and could see a group of very cheerful groomsmen in welly boots chatting to the production team. I was excited to see the ceremony space. 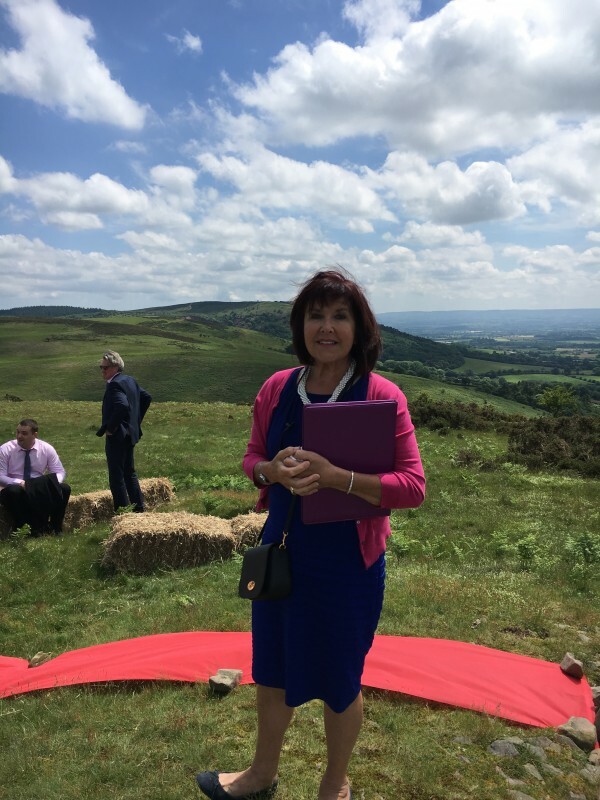 Gavin had laid the hay bales out exactly as I’d asked – with curved rows for the guests and a row of bales on the right and left of the aisle at the top, facing each other. One for the bridesmaids and the other for the groomsmen, with space for him and Sophie to sit during the readings. There was a red carpet leading up to the cairn. It was a beautiful warm, sunny day, everything was ready !! Gavin was pretty nervous and very emotional. He couldn’t wait to see Sophie again and really wanted to have done a good job for her. Family and friends started arriving , an outdoor wedding ceremony was certainly a new experience for most of them. There was a wonderful atmosphere and everyone was excited, happy, frIendly and pretty chilled. It’s always a special moment at a wedding ceremony when we catch the first glimpses of the bridal party – and it was doubly so, as it was all such a wonderful surprise to all of us, except of course for the three guys who had chosen everything. Sophie had a rather long walk, but she looked absolutely stunning, radiant and happy. Gavin was in tears when she came up to him, and couldn’t keep from holding and hugging her. It was a wonderful reunion of a very loved up couple that had really missed one another. Although it was being filmed and there were quite a lot of crew about, once the wedding ceremony started, the film crew took a step back and it ran in an intimate and personal manner, without interruption. I chose my three favourite poems for the three readers Gavin had “nominated’, at our meeting. It certainly took them by complete surprise. Their lovely little son, Teddy, was the ring bearer. However, when one on the best men gave him Sophie’s wedding ring to bring up , he didn’t want to hand it over ! 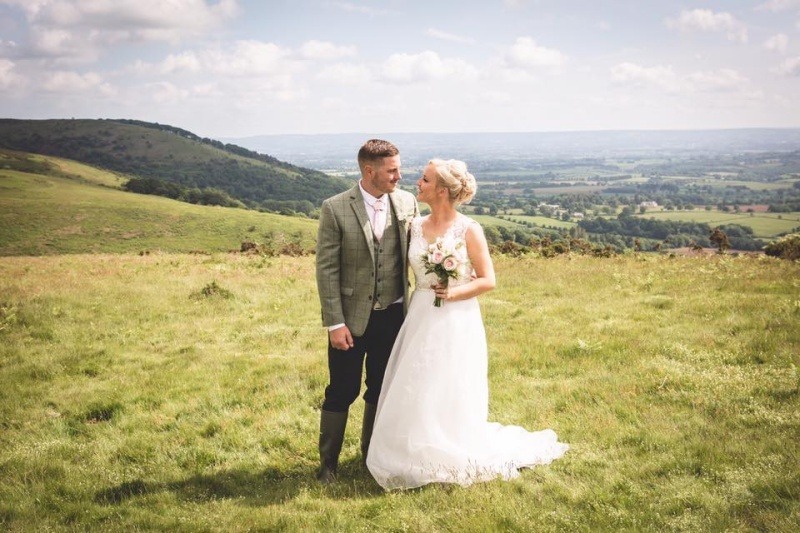 As you can see from the welly boots, Gavin’s country clothes, hay bales and tractor, the wedding had a farmer theme – to match Sophie’s surname – she arrived as a Farmer but left as a Cross. Clever – don’t you think ?? Anyway, once the ceremony was over I grabbed a quick pic with them and left. I had no idea what surprises Gavin and his best men had laid on for the rest of the day. I had to watch the programme to find out ! 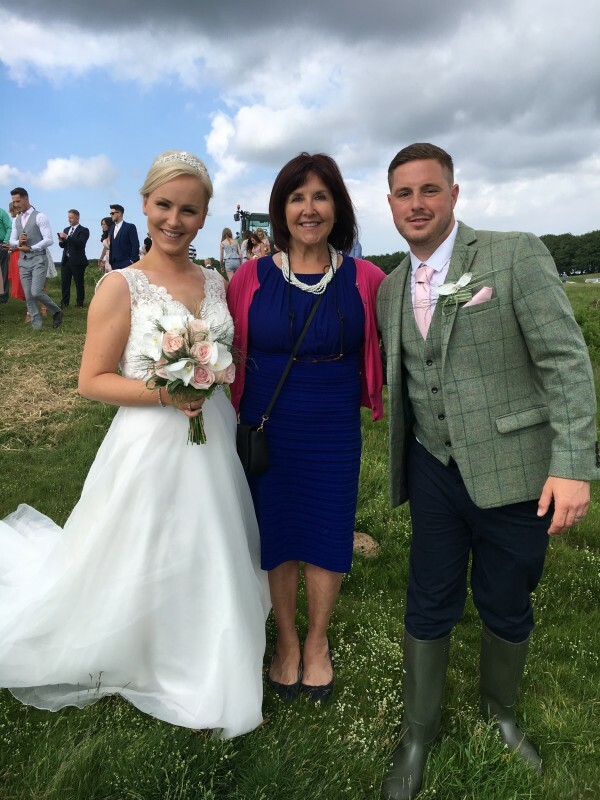 Congratulations to you both – a beautiful couple and an amazing day !!! !.